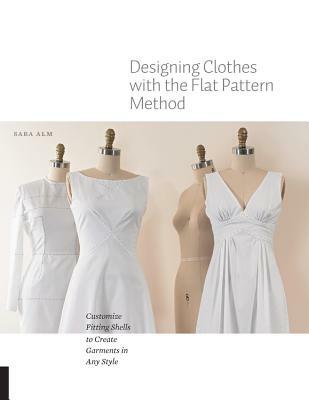 Learn how to customize your clothes--designing new pattern shapes, style lines, and fashion details with Sara Alm's easy-to-follow instruction! In Sara Alm's Designing Clothes with the Flat Pattern Method, sewers learn a technique that opens up myriad possibilities for making one-of-a-kind garments. By using basic pattern blocks called slopers, Alm shows sewers how to design new shapes, style lines, and fashion details--creating patterns for nearly any piece of clothing they want to sew. Take a basic straight skirt pattern, for example, and convert it into any other skirt design. Change the hemline or the basic shape of a skirt from straight to A-line to full swing with multiple gores. Try adjusting the waistline placement or convert it from waistband to waistline-facing. Change the style and placement of the closures. The options are endless once sewers understand the basics of flat-pattern designing, which is explained in the book. Designing Clothes with the Flat Pattern Method is divided into sections: skirts, tops, and pants. While many of the same principles apply to each garment type, there are different techniques to take into account. As soon as sewers know how to design from these three slopers, that knowledge is easily transferred to designing dresses, shorts, jumpsuits, and outerwear. The principles and techniques taught are also easily transferable to designing children's clothes. By following extensive technique instruction in each of the three categories, twelve different garments are designed from each basic sloper and photographed on models so readers fully understand the process and the end result. Thanks to Designing Clothes with the Flat Pattern Method, passionate sewers will be as skilled as Project Runway contestants in no time! Sara Alm started sewing dresses at age six, and she's never looked back. After graduating from the Apparel Arts patternmaking program in 2005, Alm has worked as a patternmaker, designer, and sewing instructor at Apparel Arts. She also shares her passion for garment-making by teaching sewing and fashion to at-risk teenage girls. Alm is the co-author of Famous Frocks, and her latest venture is launching a line of women's activewear. Alm is the instructor for five Craftsy Classes--Mastering Construction: Facings and Linings, Mastering Construction: Foundation Techniques, Mastering Construction: Zippers and Waistbands, The Essential Guide to Sewing with Sheers, and Inside Vogue Patterns: Tracy Reese V1397.